“Ma Ta Liu” Curry Noodles, or also known as “Police Station” Curry Noodles, is how the Ipohans call it as it’s just a stone’s throw away from a police station (duh!). 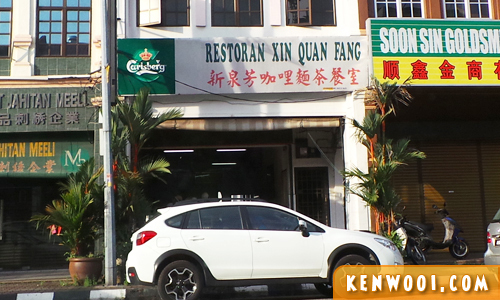 This is a MUST TRY breakfast option at Xin Quan Fang if you’re on an Ipoh Food Trip. 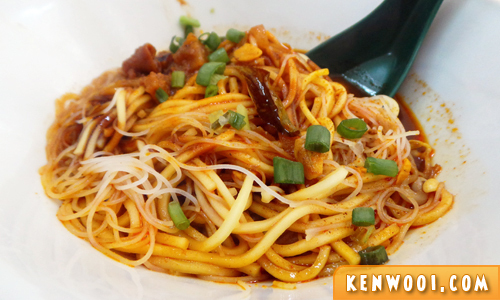 Xin Quan Fang probably has one of the best curry noodles in Ipoh town, and it’s famous for its succulent meat slices. Although I was born and spent most of my early years in Ipoh, I’ve never known about Xin Quan Fang until friends from the other states told me about this popular place to have curry noodles. My discovery of Xin Quan Fang happened about a few years back, and my first visit here was one helluva long wait. 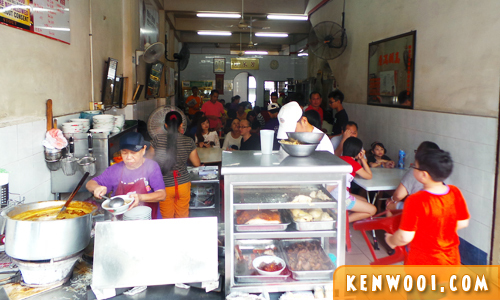 With only about 10 tables in a small restaurant, waiting in a queue is usually inevitable. Even if you’re already seated at a table (table-sharing with others is common here), you’ll still have wait. 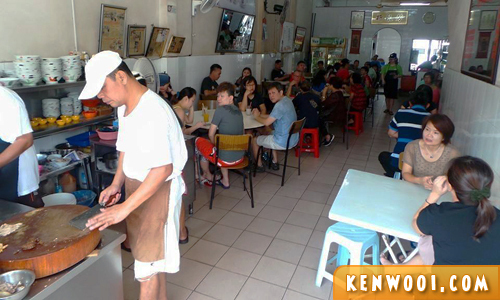 There is an ‘unspoken’ queue and the uncle will come by your table to take your order when it’s your turn. 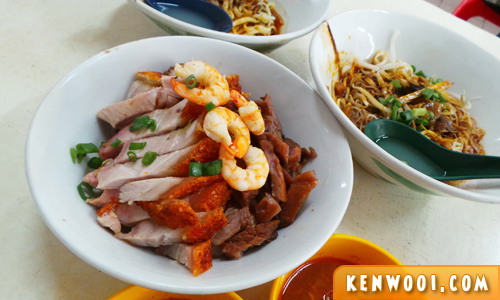 Here at Xin Quan Fang, the meat slices served ranges from steamed chicken, prawns, signature char siew (BBQ pork) and siu yok (roast pork). There are also other parts of the pork, such as pig ears and intestines, but I don’t fancy them at all. Just… yucky! Hence if you prefer only lean meat, please state it clearly when the uncle takes your order. It’s also recommended to have the meat slices served in a separate bowl – or else the meat will be served on the noodles’ plate. After a typical wait of 30-45 minutes, the curry sauce will be served. It’s a mixture of garlic, curry oil, scallions, pork lard, and lime juice. Some describe the taste as ‘magical’ because the curry sauce infuses a fragrant flavour when the meat slices are dipped into it. Soon after this, the bowls of noodles and meat slices will then be served. After all the food has been served, the uncle will mention the total bill and you’ll be asked to pay. Don’t be shocked at bill’s amount as it costs RM12 per pax (drinks not included). Yes, quite pricey for Ipoh standards but it’s the price I don’t mind paying for good Ipoh food. 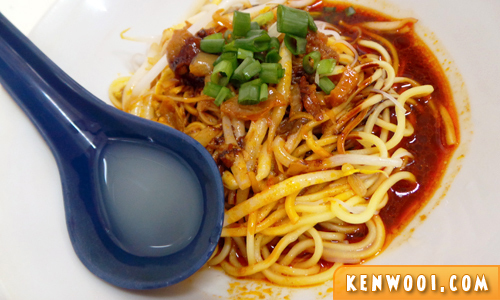 The bowl of noodles comes in a single size and it would be sufficient for a simple meal. But if you’re looking to fill up your tummy, it may take more than a bowl for that. 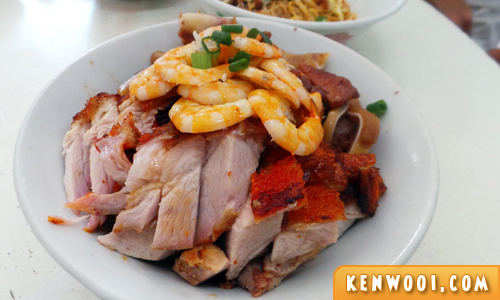 The meat slices are served in a well-arranged presentation and topped with sliced prawn. It’s always a joy to feast our eyes on this bowl as it’s super photogenic. 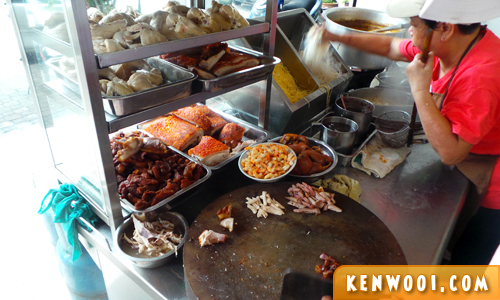 The meat slices are succulent and their homemade char siew is unlike the conventional red and white ones. 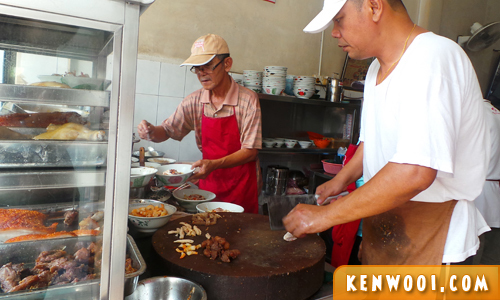 Find out more on what to eat in Ipoh! Arrive by 8am to get yourself seated comfortably. Else, be prepared for a 30-45 minutes wait (this includes waiting for uncle to take your order and for the food to be served). Queue outside the eatery and wait (in line) to be assigned to a table (either for your own group or to be shared with other customers). After you’re seated, wait for the uncle to take your order at your table. Do NOT attempt to ask any of the uncles or aunties to take your order. Be quick and certain when ordering as the uncle may be impatient if you’re indecisive. It is PREFERABLE for a Cantonese-speaking person to place the entire order. Here’s an example of how you order! 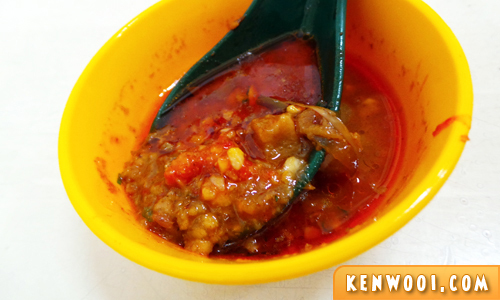 This is how you do it at the BEST curry noodles in #Ipoh! Lard? Wow…with lard sure sedap gila. Love the lard. Oh me oh my!!! I’m drooling all over!! !